So much for momentum on climate change. Reality bites. Without nuclear power, Japans emissions have hit a new record high. At the same time, even with 17% of its energy from Nuclear power, and with 23,000 wind turbines, Germany stands no chance of reaching its emissions targets. The rich, technologically advanced nation that has spent more than any other on green energy admits they’ve failed. Those who want to stop producing CO2 have billions of dollars to spend on advertising and pointless windmills, but in the end, chemistry and physics can’t be bought. If renewables could provide cheap reliable power, they wouldn’t need subsidies. Everyone would buy them. The Social Democrats replied with hard data on renewables (oh wait…). The Social Democrats said the cuts must be found because “we want to lead the world” and the EU 2030 targets are too weak. What’s 60 -100 million tonnes of CO2 between friends? Wall St Journal – “Japan’s carbon dioxide emissions were the worst on record in the last fiscal year, forced up by the nation’s reliance on natural gas and coal to generate electricity. After Fukushima, Japan closed down 48 nuclear reactors and imported gas and coal. Unless a number of reactors come back online soon, the trend of high emissions is unlikely to change much, said Tomomichi Akuta, analyst at Tokyo Mitsubishi UFJ Research & Consulting. The restarting of numerous reactors appears unlikely in the near future given public opinion toward nuclear power, he added. Polls generally show that about 60% of respondents are against the use of nuclear power. I still shake my head in disbelief that developed nations with access to the best advice money can buy have wasted their resources on wind turbines that are 90 per cent efficient only 10 per cent of the time, on average, and on solar systems that are also inefficient, and apparently with no consideration for the economic damage resulting. I still can’t get my head around why Germany with a well functioning Social Market Economy would attract such a large interest into an obviously flawed long term investment. I’m thinking that above all the economic posturing there is still an itch to rule over everything that never went away. You should put Pierre Gosselin’s No Trick Zone (notrickzone) on your daily reading list. It’s on *my* daily reading list. We now know that the Fukushima power station was not designed to handle what actually happened to it. Old technology, poor design and siting, and bad luck led to a terrible mess. How many of the other closed “nuclear reactors” (what is the number of sites?) can be said to have similar issues. Some of them must be newer, better designed, and safer. No? As for Germany – they did this to themselves. It did not take a natural seismic event to get them to this point. Some smart person has said when you find yourself in a hole – stop digging. Sigmar Gabriel seems to have gotten the message. Mein Deutsch ist nicht so gut aber Deutsch politiker ist “dummkopfs” – Ja Johannes F. Hultquist? Verstehen Sie das, Kaiser Geo? What John is saying about Fukushima is absolutely correct and the stigma attached to nuclear power in Japan is unbelievable. I work as an English instructor in Japan and I have a few students working in the nuclear power industry, but it took me a while to even get that out of them. Most of them are too scared to tell ANYONE what they do for fear of reprisals and abuse. Once they open up and realise that they can speak freely, they confirm everything that has always been said, in that Fukushima was in fact poorly designed and the other nuclear power plants are actually fine to fire up. The discussions have been quite interesting for me and I think it’s actually given them hope because I highly doubt they get to talk about this to anyone all that often. I was also told unofficially that there is still a good chance that a few of the nukes will come back online in a few years, maybe as soon as three. We can only hope. On another note though, what surprised me more is that only a handful of my particular students actually support renewables, while the rest vehemently oppose it. Their reasons are usually the same in that it can’t possibly power hospitals, pubIic transport and other vital services. I do feel hope for Japan but unfortunately, everyone is too scared to speak out? I live in hope that this will change soon and Japan will get back on the nuclear path. Most of them are too scared to tell ANYONE what they do for fear of reprisals and abuse. It is “The consensus effect” in operation. Al Gore’s primary role was to say loudly and often, that the debate was over, and that 97% of scientists agreed about climate change, and that the consensus could not be overridden, and so on. Nobody feels comfortable bucking a trend, especially when you watch a glitzy presentation, and are told that only the most stupid people don’t get the message. That is what has happened over the Fukushima incident. The “consensus” that nuclear power is very bad, has been pushed heavily by the environmental groups, who are extremely vocal in Japan, as you probably already know. My company was given the job of preparing a briefing for policy makers on the accident, with emphasis on the significant factors that existed prior to the tsunami. Very briefly, because I am summarising the document, Fukushima has four reactors each in its own building. The one that was most damaged was the oldest building – Fukushima 1, with less damage being done to the Fukushima 2, and none being done to the other two reactors. These two reactors in the other buildings are of a slightly more modern design. When the earthquake hit, all of the reactors automatically shut down the primary reaction by inserting control rods into the Uranium Oxide core to disrupt the chain reaction. Shutdown is almost instantaneous. However, as part of the normal reaction chemistry, several radioactive by-products are produced. These products include Cesium and Iodine isotopes. These isotopes continue to react as they decay into their non-radioactive states. This is a secondary reaction that has to run its course before the reactor fully shuts down. This can take days, or even weeks to occur. Normally, the reactor is cooled by clean water that is circulated through electric pumps. The electricity to drive the pumps comes from the reactor itself, or other operating reactors on site. If all of the reactors shut down, as they did in this case, the electricity supply is provide by backup diesel generators. All of this worked according to plan, following the earthquake, and there would have been no incident were it not for the tsunami. The tsunami resulted in damage to the diesel generators, which stopped the re-circulation of the cooling water. Battery backup power was then used to keep the cooling water re-circulating. Normally this would give sufficient time for backup generators to be positioned and turned on, but because of the infrastructural damage caused by the tsunami, this was not possible. All of this time, the secondary reaction, caused by the decay of Cesium and Iodine continued, and therefore created heat. So once the battery backup was exhausted, the cooling system stopped, and the temperature and steam pressure inside the reactors then started to increase. Around this time, the emergency services started to arrive, and so fire appliance pumps were used to pump sea water, containing Boron, into the reactor to replace the hot re-circulated water. This lowered the temperature somewhat, and the Boron acts to dampen the secondary reaction. However, the water still gets hot, and the pressure still increases. The operators therefore occasionally vented steam from the reactor to decrease the pressure. The vented steam contains traces of Cesium and Iodine isotopes, and this is the source of the radioactivity that has been measured in the immediate vicinity of the reactors (and reported to the IAEA). However, Cesium and Iodine have comparatively short half-lives, measured in days and years, as compared to the half-life of Uranium, measured in centuries. Also, the steam that is being released to maintain the pressure is super-heated. In superheated steam, some of the water molecules become ‘disassociated’ into its consistent hydrogen and oxygen atoms. The Hydrogen, being lighter than air, floats up into the roof, where any spark can ignite it, causing an explosion. This is certainly what happened in Reactor Building 1; the roof got blown off. Some fire damaged also occurred near Reactor Building 3; where the explosion started an external fire, possibly in the detritus from the tsunami. Could there have been a nuclear explosion? No, it is scientifically impossible. Could there have been a meltdown, with Uranium being released into the atmosphere? Not while the temperature within the reactor was kept below 2000 degrees Celsius, and even then, if the core did melt down, the design of the reactor allows for any melted uranium to run into a large hole below the core that can then be sealed with thick concrete. In the event, this is what finally happened, some several weeks after my report was submitted, and all of the following careful engineering work to date, has been concerned with how best to remove the sealed concrete container safely, and transport it for disposal. An interesting footnote is that the spent fuel rods where not actually removed off-site for disposal, as originally planned, because of objections from the environmental lobby. Instead they were “permanently” retained in “temporary” holding ponds, that were supposed to be cooled by a constant flow of fresh cold water. With the power out, once again fire appliance pumps had to be used to pump sea water through these pools. It was that water, that ran back into the sea, and caused all the alarm about radiation “flowing to the United States”. Now is the time for Australia to act decisively. I followed utilised unashamedly stole some MOST of TonyfromOz’s figures and have paraphrased artfully crafted his expert observations into a submission. Well alright, outright copied, but some of the words are in a different sequence, so it’s not plagiarised okay! Oh, and I did some of the gozintas meself. Wind Power is the only form of power generation proclaimed by the UNFCCC protocols for all countries which are still developing. The UNFCCC protocols demand already Developed Countries of the World must bear the cost. The money is to be raised by the introduction of Emissions Trading Schemes in all of those Developed Countries, the money then sent to the UN for distribution to those developing Countries for the construction of these plants. Australia to convert to renewable Wind Power energy based on today’s requirements for total power generation replacement of 188 TWH (Terra Watt Hours) currently generated by coal fired stations in Australia today. In order to convert to wind power per UNFCCC protocols Australia needs a total Nameplate of 72,000MW. To achieve this Australia needs 28,595 wind turbines with 205MW nacelles. A typical scale Australian Wind Plant of 200 towers generates around 500MW for a cost of $2.2Billion with a Capacity Factor of 30%, or a bit over 7 hours a day. Australia needs 144 Wind Plants each of 200 Wind Turbines at a cost of $316 Billion. The cost of this energy is born directly by the taxpayer at a cost to each individual Australian of $12,640 or $40,500.00 per household. Once this establishment cost is completed ongoing cost will be energy usage at approx $2,600.00 per annum per household. Each Wind Plant required by the UNFCCC protocols slaughters an average of 3,500 birds and animals per annum including valuable and rare raptors, eagles, hawks, bats etc. The cost in Australian native bird and animal life would be kept at a minimum of say around 700,000 deaths per annum. Given this evidence – can we afford not to? *All credit (and many apologies) goes to TonyfromOz from whom I knocked off most (if not all) of the information for this post. With a plan like that who needs to worry about outside threats to our country? What better way to destroy our economy and let another country walk in and take us over. Perhaps that’s what the ALP and Greens are hoping for – to have China or Russia step in and take over. It wouldn’t surprise me at all. But PeterS, there is one particular ideology that the green movement supports, it is not China or Russia, but the one that will reduce the enemy of Gaea -humans- by be-headings. Only for the first year or so.. the number slaughtered would reduce rapidly after that. ! Probably only until about 2045, Greenpeace reckons we’ve already killed off half the wildlife on the planet in the last 50 years and so just extrapolating at an increased kill rate, by about that time there shouldn’t be any wildlife to fowl foul Wind Turbines or solar panels. Win/Win, or as we in the trade say – Wind/Win. But CD, all these new wind turbines would almost certainly be built right on the major migration paths. (anywhere…just so long as they are not near the inner city greenies)..
…so with that many new wind turn=bines, the kill rate would be far higher. Couple of seasons migration.. that’s all it would take ! ….. ALL of them in NSW !! Really, that’s how ****ing arrogant these scam artists are ! Okay, so what are the 5 major species groups? There’s nothing in your post indicating 3 of them, I see birds, cats, are humans in there? In fact there isn’t enough information in your comment for anyone to draw any sort of conclusions at all. Instead as is the norm for you, you puke up some “data” claiming it means/supports something without providing any context, details, or ANYTHING that would allow anyone to derive any sort of meaning from it. Well, not exactly, it does provide us with yet another fine example by which we can derive your lack of knowledge on anything you comment on and your obvious inability to think about and discuss anything in a manner that other intelligent, rational people could understand. We aren’t on whatever it is you’re taking so we don’t hear those voices. If your data is so good why no link to your source? God knows we’ve seen your “woodfortrees” nonsense link enough times. Afraid someone will once again prove your source is flawed? If you believe your own models. They prove enhanced opportunities for cats to climb Wind Turbines to catch birds. I thought so, no link just more puked up noise from you. I suspect you meant to write “They provide enhanced opportunities” not “prove” which just goes to show how gullible and out of touch with reality you are. Although you could take a few photos of cats climbing wind turbines and show us. Keep it up girl, you and your mouth are your own worst enemy. Models don’t provide jack for cats to climb on. However the models prove that the opportunities for cats to catch birds are enhanced by Wind Turbines – the models also prove the mortality rate of adventurous cats is also increased. Mostly cardio vascular events precipitated by a combination of being overfed and climbing all those turbines. Models also prove some smaller percentage of cats will die of misadventure like when a ball of string inadvertantly gets caught in a turbine or traffic accidents whrn falling alseep behind the wheel after a hard night catching birds. Grrr…. I thought you were the other SF. Apparently I need some more caffeine. Oh and I disagree, I’ve been building models since before my teens and cats can definitely climb on them. Cars models survive better than ship models though. Chuckle.. was wondering when you would notice, Robert. Shrilly and ChesterDude are cool. Whoever they are. silly filly Please just go away. I think you meant 2.5 MW nacelles (line 3 under goal) not 205 which don’t exist. You also missed a couple of minor? points and 1 major one. Minor 1: As the number of wind farms increases the Load Factor drops because there aren’t that many good sites available. Germany has lots of wind turbines but the load factor runs between 16 & 18%. Minor 2: The cost of maintenance, which would be at least 10% ( UK on land ) or 20% ( Germany inland ) or 20-25% (UK offshore). Major: It is absolutely impossible to have 100% renewables, because there must be conventional electricity available whenever the renewables start. The turbines have to draw power for the yaw motor to turn the nacelle into the wind. Also the blade motors set them at the right angle for the wind speed. That means a reference (and re-charging) for the controlling instruments. You cannot do it with wind and solar as there are several hours when neither is working on most days. You also have to have the phase angle right or you wind up with no generation, just losses. Don’t blame me, what do I know from MW Nacelles? I copied it directly from Tony’s post. Are you a narc or something? “It’s worse than they think”. Graeme No.3 ‘s point is correct but ignores the job creation opportunities of renewables. There will be human driven capstans, treadmills and gears to turn the towers into the wind. The humans will need appropriate motivation, non financial of course, which could be well documented stone age methods. Creative plagiarism at its best. Which emissions target? There are so many and they keep moving them. Also, the elephant in the room is still excreting more and more CO2 with absolutely no sign of reversing. So even having any target is a joke. If any leader is seriously interested in reducing emission then the least they could do is start embarking on a major program to build as many nuclear and hydro power stations as possible, which in fact is what China is doing but at the same time they are also building more and more cleaner coal fire powered ones, which is one reason why they can’t have targets despite the adoption of best practices. For China to set targets would be against their economic best interests. yet the Greens want to use them as an example of how we should act without realizing all this. I say to the Greens, yes let’s do what China is doing – build nuclear and hydro power stations. Of course the Greens are so blind to see what they are doing. Hey, if word got out about how poorly German wind power really performs, then perhaps people might think twice about wind power. They have (as the link mentions) around 23,000 of those wind towers. The total Nameplate comes in at 29,000MW. The total power delivered is 45.5TWH, which is in fact around 7.5% of Germany’s total power consumption, which may sound impressive, but it needs careful explanation to get the real picture. That 45.5TWH total generation only equates to a Capacity Factor (CF) of 17.9%. Sometimes Capacity Factor is not all that easy to understand. Now, while the CF is across a whole year, it equates to an extrapolated average generation time of barely four and a quarter hours a day. Think of it this way. If you purchased a new electrical item, (anything at all) for your home, and it was designed to operate in the same manner as for wind power, it would only work on the basis of one time in five (well, less than that really) every time you turned it on. Or even your car. It would only start one time in five when you turn on the ignition and fire up the engine. How happy would you be with that? They can have all the towers they like, but if they only work on this basis, then they are just not worth the Billions thrown at them. And when they are not generating, the only fall back is those fast run up Natural Gas fired plants, only now, instead of operating for just a dedicated few known hours a day, they have to fire up on short notice on a now sporadic basis, as the grid controllers suddenly find they need more power because the fundament has fallen out of wind generation. That’s no good for those turbines, on off on off on off all day as needed, consuming more natural gas in that manner than for their previous dedicated run times. Wind power fails the reliability test. Don’t mention the war wind. I did once but no one was listening. They could have made the announcement BEFORE the G20. Would have saved an awful lot of hot air and possibly Obama making a complete dill of himself ( although that is a big ask – he does seem committed). Dill yes but committted? Not yet. Committed to being a dill. So 23,000 windmills at $20M each, $460,000,000,000 in investment and only a bunch of windmills to show for it? Unbelievable! Imagine if that had been spent on research into Thorium? Or fusion? Or anything else, like aluminum/metal recycling for fuel so that there was no CO2 and we stopped burning precious and non recyclable fossil plant matter? It is all about wind, water and no fire, so we just will all wait until the coal and gas run out. This shows how the anti science, science ignorant Greens have corrupted politics to the point where massive monies are spent doing nothing useful for no worthwhile purpose to solve an imagined problem. When did the loonies take charge of Germany? Then it is the same in so many wealthy countries who should know better but scaring people means political power. Every dictator in history knew that and it still works. The installed cost per 2MW turbine is closer to $3.5 million. Whilst it is widely acknowledged that wind is intermittent, it is also now widely accepted as a cost effective part of our energy mix. … it is also now widely accepted as a cost effective part of our energy mix. I have yet to see any audited All-of-Life Cost estimates, including site restoration as original. Do you have any? nuclear ~ $95 plus TerryYaki’s comments above about extra costs. Wind $100 – $140 the higher figure from the UK Department & inflated by off-shore supply. concentrated solar heat $220-280 (based on Spanish plants). BS !! It is a tiny niche market, incapable of supplying more than a pittance of requirments. Remove the subsidies.. and wind turbines will become useless hulks in a few year. Nah… just give them 15 years, subsidies or not they will still be useless hulks. Yes, but I just read that the Japanese announced a major contribution to the Green Climate Fund so it’s clear that they’re serious about addressing/combating/fighting/tackling/taking action on climate change. It’s all about doing your bit, playing your part and making your contribution. Australia is terribly far behind in the global effort, particular when compared to the Chinese – it’s all over the news. I mean, on the one hand you have a 20 a day smoker who, in acknowleding that his smoking is very bad for everyone, loosely agrees to smoke only an extra cigarette each day for the next 16 or so years with the intention of not adding any more to the daily intake after 2030 – they might be on 35 a day by then, but at least they’ve demonstrated to the world their seriousness about dealing with the problem – making such a landmark/groundbreaking agreement in the first place would have required a great deal of will power. On the other hand you have a half a cigarette each day smoker who, in acknowledging the same problem, plans to reduce his intake to 0.45% of one cigarette within a few years. It should come as no surprise to you that everyone is applauding the 20 a day guy for his intended efforts and berating the half a day guy for his comparatively poor attempt. Sorry – sarcasm or analogies aren’t my strong point but I find it fascinating to see seemingly intelligent people claiming that China is taking AGW seriously. They aren’t, and to argue otherwise makes you sound a bit simple. Things are abandoned as being part of the ‘bad old ways’, but then get reinstated when they figure out that the negatives were relatively minor in comparison to the good that they did, and/or you can do without them anyway, or both. They then formulate a new approach which seeks to minimise the negative effects, in the process realising that this is what was going on previously in any case, to which they previously ignored. People never seem to learn from this circular process. “If we do not put a brake on climate change it will have devastating consequences,” she said in an address to the Lowy Institute. She noted the European Union had agreed to cut emissions by 40 per cent by 2030, calling the commitment “an important marker” ahead of global climate talks in Paris in 2015. “Only in this way can global warming be limited,” she said. So much for the headlines. Ho hum! So then sillyfilly, what 85% of all the electrical items in your home are you going to do without, you know leading by example and all that. No more shopping at Coles or Woolies for you. In fact, virtually no more shopping at all. No car, no job to go to, and I hope you or your children never get sick and require a hospital. No air travel, in fact, virtually no travel at all, air, road sea or rail. Everything you write here is from the standpoint of gross hypocrisy, and if you want to know what that is, then look in the mirror. …. and ignorance and empty-headed, non-thinking idiocy !! OMG! And here I thought Fantasyland was confined to Disney! Both seem to be within your tiny little mind..
….explains why there is so little room for anything else. Prancing around trying to do a comedy act in a plea for attention…. so sad !! No, it’s alive and well between your keyboard and the chair. question evasion by the motley mare….. duly noted. You do realise that you are currently totally reliant on that fossil fuel power, don’t you ! You bet could not exist without it. Yet that is how you would wish people in undeveloped countries to remain. You are a sad, sad person… ugly to the very soul ! You “thought”? That’s a first. I’m surprised at you for providing such an ill-informed post. Surely you realise that, as a fully fledged member of the politburo of the People’s Democratic Republic of East Gosford, and also the Undersecretary of the Carbon Emissions Limitation Steering Committee, that Ms. Filly would not have to be placed under such onerous restrictions to her personal power usage. That would be unthinkable, important government officials like her are exempt from such considerations. As a result of your egregious breech of party protocol in making such an assertion, the Central Committee deems you an enemy of the state, and as such liable to a doubling of your contribution to carbon mitigation. As a result, instead of going without 85% of YOUR electrical appliances, we sentence you to a mitigation of 170% of the carbon allottment of your appliances, payable immediately. All cheques made payable to : M. Strong, PO Box 666, Shangzhou, China. A politician saying what she thinks people want her to say, rather than speaking honestly and openly about what they are doing, and what they will do in the future. Who would have thought? sillyfilly I’m excited to announce that you have won a free one way trip to North Korea, where upon arrival you will be issued a regulation haircut and expiry date. You get to jump the queue ahead of all those stupid climate deniers and start living the utopian dream you deserve, leaving the rest to wallow in their own miserable lives. Details will be provided soon on your voyage aboard a completely sustainable wooden pellet boat, congratulations and good luck. She will love it there..
oh wait….. don’t the NK eat horse meat ? I imagine a horse, even one with mad cow disease, would be quite a meal for maybe a 100 or so families. ………………… or for one dictator. ! All RETs immediately met ! Just think of the commercial manufacturing opportunities that open up, if and when, Europe shuts down its manufacturing industries to meet this target. China and India would have to step up to the plate, to provide the goods and services that Europe could no longer provide for itself. To ensure a clean transfer of manufacturing capability, we need to have representatives from Asia and India in senior positions in the UN and its subsidiary agencies. Say, one to manage the overall operation, and one to oversee the Change Programme — somebody who knows how the Indian and Chinese industrial industries work. Now, what names come to mind? Jo, please ban silly filly. Its great that India and China have decided NOT to compromise their economies on this alarmist CO2 witch hunt. There will be more than enough CO2 to go around for many, many decades to come. 600+ ppm is still well within reach, thank goodness. Certainly enough to see off the GW farce. The reality is gradually awakening in other countries, that cutting the use of fossil-fuel energy means economic suicide. Obarmy may be stupid enough, but the Germans can see the writing on the wall. Yes, they will speak the rhetoric, play to the silly alarmist crowd, but watch as Germany continues to ramp-up its fossil fuel usage over the coming decades. In many way it doesn’t matter what our views on climate change are, because the world will continue to develop renewable energy and the future will be a mix of nuclear, coal, renewables, energy efficiency and energy reduction. We have reached peak oil as far as easy and cheap Middle Eastern oil is concerned, with OPEC nations in that region having to drill further off-shore to find more. Fracking, arctic drilling and tar sands are certainly no panacea to our oil supply problems with each suffering from either very short production spikes, or requiring 2 to 3 times more energy to produce per barrel compared to oil from the Middle East. Global consumption is 89 million barrels a day and rising whilst production cannot keep up. Canadian tar sands will provide 170 billion barrels, or in other words satisfy just 5.5 years of global demand – whilst decimating an area the size of the UK with strip minding and highly toxic tailings ponds. Any American that thinks tar sands will provide their nation cheap oil is misinformed or deluded. If nuclear were to replace coal we’d need 10,000 of the largest stations we could build and would likely consume every ounce of Uranium with 10 to 20 years. China is most certainly going to reduce it’s coal use due to chronic air pollution and will continue to commit to renewables. It’s also important to note that advances in renewables continue. For example 1st generation wind turbines were around 1MW. Typically they are now 3MW, with 6 and 8MW ones on the way. Many forms of heat storage for solar thermal are being developed to allow power production when there is no sun. Whilst I’m not deluded into thinking that renewables will replace coal, oil and nuclear anytime soon, the development of it is unstoppable. And when we consider that just 20 days of sunshine contains as much energy as is stored in all the world’s reserves of coal, oil and natural gas, it seems like our destiny to harness it. Germany has certainly been a little overzealous in its haste and rushed ahead before its economy can catch up, but it’s long term course will not change. It has demonstrated that one some days it can produce half of all its power using solar, and that experience cannot be undone. Best to work together to accommodate all views and desires, and the fact that just as human curiosity caused us to both split the atom and exploit the remarkable resource that is oil, it will also lead us to exploit solar and other forms of renewable energy and one day become very efficient at it. Your assertions would be quite reasonable except that solar and wind will never achieve even a fraction of what you aspire to. They are failed technologies rebadged by cynical carpetbaggers for undeserved profit, and destined to be consigned to the dustbin of history as a blind alley that led humanity away from energy sufficiency, and prolonged our dependence on fossil fuels rather than shortened it. If LENR/cold fusion were a viable reality for example, there would be not one skeptic who would object to its widespread implementation as an alternative to coal, oil, etc, because it would be legitimately preferable as cleaner and more efficient, not a spurious and deceptive con like wind and solar with false promises based on lies and deception. 1. Technology- Wind and solar power are given prominence as supposed large scale, base load alternatives to efficient fossil fuels like natural gas, oil and coal. Both technologies suffer from their irredeemable intermittency that intrinsically makes them unsuitable for the provision of 24/7 base load power. They also introduce unwanted and dangerous instability into power grids, in both voltage and generated power, while delivering often a fraction of their capacity factors (~15-20% on average, and note that averages say nothing of the predictable delivery of power at a given moment in time- an important concept where these modes of generation fail hopelessly). One needs a constant power input, from coal, or hydro, or nuclear in order to maintain the spinning reserve. As a result, wind and solar do not eliminate more than an insignificant amount of base infrastructure (including the provision of coal fired or natural gas base load) in spite of the massive capital investment that has thus far been wasted. These “renewables” are thus inherently reliant on fossil fuel back up of the same nameplate MW capacity (e.g. nat. gas, coal or nuclear) and they are prohibitively expensive (as a consequence of their inefficiency, cost of manufacture and infrastructure gold-plating required by their intermittency) to the point of rendering the industries and commercial interests reliant upon them increasingly uncompetitive and uneconomic. The government subsidies used to artificially prop up this ineffective and impractical technology have therefore been systematically misappropriated, and they have failed in their alleged task of making most if not all of these ventures competitive or at least viable. It has failed to garner the expected technological innovation required to allow large scale storage of any power generated, nor to scale up these facilities to a level sufficient to provide more than an expensive token percentage of our overall power needs without importing it from elsewhere. In addition, neither wind or solar can truly be considered renewable, they have far shorter life spans than advertised (10-15yrs -not 25-30yrs- compared to coal fired power stations at 50yrs+) and are a looming toxic burden on the environment, exemplified by rare earth metals mining required for the magnetos used in wind turbines (lifespan 10-15yrs with diminishing power yields after 4-5yrs), or the highly toxic and carcinogenic substances (Arsenides, Lead, Cadmium, Chromium VI, Sulphur Hexafluoride, Thiourea, CCl4, SiCl4, Selenium Hydride, Germane, etc) required in the manufacture of photovoltaic solar panels (Note- over 4 tonnes of toxic waste and chemicals is required for every tonne of photovoltaic material manufactured) and the upcoming issue of their disposal en masse at the end of their life within the next decade. While not necessarily more toxic than alternative modes of generation, they are neither as “clean” nor as “renewable” as pretended by advocates. Also, as wind turbines age, their efficiency declines due to, among other things, aerodynamic blade deformation, gearbox and component wear and stresses, reducing to only about 50- 60% efficiency compared to the new turbines, requiring significant reinvestment at high cost for premature replacement relative to fossil fuel based power generators. Wind power requires enormous areas of often arable land for wind farms, requires intensive forest and land clearing, needs copious transmission lines, uses huge amounts of steel and concrete in construction, and kills enormous numbers of bats and birdlife (est. 200-670 bats/turbine/year, 110-330 birds/turbine/year) especially vulnerable birds of prey (many of whom are endangered) such as various species of eagles, vultures and other migratory and seabirds. In addition wind farms also dramatically alter local weather and microclimates by raising the surrounding temperatures by up to 1 deg C, changing local wind speeds, altering local atmospheric moisture content and increasing localised fog, as well as acting as visual blots upon often pristine landscapes, and sources of unacceptable levels of noise pollution (both audible and infrasonic), with as yet unexamined potential for adverse health effects to those persons living nearby. 2. Biofuels- Among the more sinister aspects of the CAGW doctrine has been that of subsidizing, mandating production and the use of biofuels, purportedly to replace fossil fuels. This policy is particularly anathema to those who would seek to alleviate poverty, hunger and disease among those living in the poorest “third world” nations. On first principles alone, the very idea of using food staples such as corn (maize) for fuel for motor vehicles, in a world where hunger is still an ever present threat to a significant proportion of the planetary population, would seem objectively to be a monstrous act of malfeasance, willful neglect or both. On latest estimates, up to 40% of current US maize production has been diverted to generate biofuel, with the yield grown to fuel one SUV for a month reputedly equivalent to that needed to feed one 3rd world child for up to one year. In addition to this, diversion of arable land in these countries to grow crops for fuel rather than food has obvious potential for contribution to worsening hunger through reducing local food production capacity, while the effect of these subsidized crops on contributing to producing higher global food commodity prices have been shown in several studies (Pimentel and Patzek 2006, Godfray et al. 2010, De Hoyos and Medvedev 2009, etc). This ultimately most acutely impacts on the poorest and most marginal people, who direct the greatest portion of their earning capacity (up to 80% in some instances) to food. As a consequence of these effects, biofuels have possibly contributed to hundreds of thousands of deaths per annum already to date, with the promise of many more to follow should this practice continue unchallenged. These valid concerns still fail to consider the entirety of the environmental impact resulting from biofuel generation. From rainforest destruction in SE Asia to plant Palm Oil plantations, to large scale sugar cane field burning in Brazil, to increased ground Ozone from ethanol fuels, there are a multitude of environmental concerns to be considered, even aside the potential human impacts described above. Biofuels from sugar cane, in the third world at least, leads to large increases in emissions of Volatile Organic Compounds (VOC’s) such as formaldehyde, acetaldehyde, 1,3 butadiene, benzene and PAN, as well as large increases of carbon monoxide, nitrous oxide, sulphur dioxide, etc over conventional fuel generation. This does not include the fertilizer inputs and fossil fuel expended in transport requirements, or the methane plumes caused by phosphate and nitrogen-rich fertilizers. So, by all means work together to seek alternatives to broaden our fuel and energy sources, but realise that wishful thinking, lies and deception in an alleged noble cause are likely to cause much greater hardship and suffering, death and destruction, for no measurable benefit, and quite likely demonstrable harm as fuel and food are inexorably linked to one another, and the West impoverishing itself will only force the 3rd world into even greater privations, starvation, disease and death. My conscience will not allow me to stand idly by while our western governments, in their ignorance, kill off the most vulnerable under the guise of protecting the planet. Such misanthropy is at the heart of the alarmist doctrine, and like Nazism before it, must be fought and defeated. Some interesting points, and a lot of copying and pasting too I discovered. I found an article that states “This level of degradation reduces a wind farm’s output by 12% over a twenty year lifetime, increasing the levelised cost of electricity by 9%”. Somewhat different to the assertion of 50 to 60% loss of production. You may wish dearly that renewable energy is going away, in the same way that I wish we didn’t have to dig up coal, oil or uranium and risk oil spills, air pollution, mercury pollution, ocean acidification, nuclear waste, nuclear accidents and all the tax payer subsidies that goes with those industries to make them viable. But the reality is our opposing power generation methods are here for the long term and going to have to lear to live with each other. Yes, and I note you addressed only one, and that was a nitpick about percentages in decline in wind performance, rather than to deny the fact that they do decline measurably over time. I feel your response defines the morality (or lack thereof)of your position. You are unconcerned whether renewables actually work as advertised or can ever be scaled for purpose, you are immune to concerns as to the economic destruction incurred on economies in the developed and developing world, blissfully unconcerned whether they use up arable land that could be better used for food production in a world where a significant percentage struggle to feed themselves, unfettered by thoughts of their effects on staple food commodity prices in the 3rd world and how that might effect the most marginal by tipping them into starvation. I never pretended otherwise-in fact I did so to make it easier for you rather than have to wade through hundreds of links- hence the quoted bracketed comment above -”Appropriated from various sources, too numerous to attribute- Jo, Tony, Rereke, to name a few”. The only reason renewables won’t go away is the corruption and crony capitalism of governments, the egregious theft of taxpayer dollars to prop up a technology not fit for purpose, and promises of vague hoes of technological breakthroughs that would make square pegs fit in round holes. That is NOT GOOD ENOUGH. Lives are at stake. The difference with fossil fuels is that they actually work, are energy dense and bountiful, and have a proven track record with known manageable risks – as evidenced by the fact that those countries most utilising fossil fuels actually have the cleanest environments. I would like these renewables theorists to explain how dialysis machines, or heart monitors, will work with an intermittent mains frequency (they are dependent upon it, don’t-ya-know). Why, even a simple alarm clock synchronises to the mains frequency, for its accuracy. A good excuse for being late to work, I guess. Imagine America at the moment with only solar and wind, 50 states have registered sub0freezing temperatures. Solar panels do not work under 2 ft of snow ! You prove in one sentence that you have NO IDEA what you are talking about ! China will continue to INCREASE its building of USC coal power stations because it GREATLY DECREASES atmospheric pollution. With the controls on real pollution that they put on those things , basically the only by-products are H2O and CO2. The Chinese are not stupid….. They KNOW that CO2 is highly beneficial to plant life and has basically zero effect on temperatures. All the mis-information about peak this and peak that.. we have more known reserves now than we ever have had, in basically every usable type of fossil fuel. NO country that wants to actually PROGRESS and GROW will pay more than lip service to irregular, irrational, highly expensive farce of wind and solar. They are NON-alternatives. With the rotting corpses of derelict wind turbines and solar plants left for the next generation to clean up. Without the likes of TerryYaki, we would not have gone looking for extra reserves, so we would not yet know that they are there in abundance. Wind and solar will cease almost as soon as governments find that they can no longer afford the massive subsidies. They are unviable even to run, let alone build, without that government funding. Like the rusting hulk of the wave machine off Port Kembla, the builders and scammers who sucked off the funds will have disappeared, leaving the tax-payer to clean up the mess. ‘You may wish dearly that renewable energy is going away, in the same way that I wish we didn’t have to dig up coal, oil or uranium and risk oil spills, air pollution, mercury pollution, ocean acidification, nuclear waste, nuclear accidents and all the tax payer subsidies that goes with those industries to make them viable. But the reality is our opposing power generation methods are here to stay for the long term and going to have to learn to live with each other’. Ps, you may believe we don’t have peak oil, but that opinion contradicts that of every CEO of every oil company in existence. Renewable energy use is only going to go in one direction, like it or not. For the last 50 years I’ve been hearing we were going to run out of oil in the next 10 to 20 years. Yet here we are, still pumping it out of the ground and using it for both energy and raw material for a wide variety of useful end products. Whatever anyone, PhD or otherwise, may say about peak oil and whether there even is such a thing as peak oil in the first place, you can rest assured that the problem of finding and extracting more oil will go on, just as it has since the first uses of the stuff in the 19th Century. The same will happen with coal. When renewable energy can stand up on it’s own feet and haul the load then it will finally be able to compete with fossil fuels. And there is no visible evidence that it will ever compete. Life always presents problems and the marketplace is where the solutions get prioritized and sorted out eventually. And not even the force of government has ever changed this. Remember what happened to all those centrally controlled economies called Communism. They finally fell of their own dead weight or drastically changed to adopt free markets. The couple that are still around are literally rotting away from the inside. And so will renewable energy fall unless it suddenly gets a whole lot better than it is right now. You can count on that. It is in fact the CEOs and geologists at oil companies, tasked with finding oil that are confirming dwindling output from conventional sources. And it is widely acknowledged that OPEC nations inflate their reserve numbers to allow them to continue to extract at a sustained rate. If conventional oil was still so abundant then Middle Eastern OPEC nations would not be moving further offshore to get it. And we wouldn’t be considering extracting oil from tar sands which has an energy invested on energy returned (EROI) ratio of only between 3 to 6 units for every 1 invested. Whereas dwindling conventional oil had a ratio of 10-20 to 1. But your last point I think rather agrees with the idea of continuing to develop renewables. If we don’t develop renewable technology then it will never stand on it’s own two feet. But the march towards this technology is happening and unstoppable. The technology is becoming more efficient and affordable each year. Execs at many major US energy suppliers now state that wind is an integral and economic part of their energy supply mix. There is as much energy contained in just 20 days of sunshine as there is in all the earth’s reserves of coal, oil and natural gas. It is inevitable that we will exploit this resource. Whilst the technology and economics may be shaky at the moment, it is changing. Strangely, plants can convert sunlight into energy in greater amounts than is actually available in the sunlight. I’ve read that some scientists suspect this is due to the effect of quantum physics which allows particles to exist in two places at once. One day, humans will be very efficient at harvesting sunlight energy and look back upon this period as a quaint phase of transition from one energy source to another. Humanity started off by burning wood. Then we moved onto whale oil, then coal, then oil. We will have to move again and given the stupendous amount of energy available from the sun and other forms of renewables, it only natural that we explore it. Consider that nuclear energy was and still is heavily subsidised. It was touted as being ‘too cheap to meter’ when being developed (even though engineers at Westinghouse and G&E calculated that this was not going to be the case during the 1950s). It is now referred to as ‘too costly to measure’ when construction, decommissioning and waste storage are taken into account. Costs for these three elements are always, and have to be footed by the tax payer as energy corporations simply could not afford to do build a nuclear plant otherwise. Finally, I’m glad you brought up the point of communism. What we are moving towards now is worse – Oligarchy. Because that is what communism transformed into. A small group of wealthy elites who controlled the masses who had little. Feed in tariffs in Germany have encouraged decentralised power generation whilst giving farmers and households extra income or reduced power bills when they produce electricity. That is true democratic capitalism. Thanks for setting up that point Roy and appreciate the discussion. Well it would be nice to think that we will be very efficient at harvesting sunlight energy, one day! You don’t seem to have considered energy density. While the sun delivers lots of energy, it is spread out. 72% of the Earth is ocean, are we going to cover them with solar panels? Are we going to cover the agricultural areas? If not, and there are very good reasons why not, then the amount available drops quite a lot. There is a little matter also of conversion efficiency which is restrained by quantum physics, and collecting the generated power and getting it to where it is needed. “Whilst the technology and economics may be shaky at the moment, it is changing”. Not quite true. There has been a dramatic drop in the cost in the last 30 years, helped by moving to large scale production, but much of the drop in the last 5 years is more to do with the global recession and desperate attempts by panel producers to stay in business. Despite government subsidies many panel producers have gone bankrupt, indicating the price is below cost. The increase in efficiency has been quite modest. The natural limit for single layer cells is around 32% and you can’t expect to reach that. That leaves your unspoken assumption that we have to stop producing CO2, a rather contention point which you, perhaps wisely, avoided. You do mention plants converting sunlight, which they do around 3 -7% efficiency, but note that as CO2 rises so does that efficiency (at least until around 1400 ppm.) So extra plant growth will have a retarding effect on CO2 rise. My last point is that industrial scale exploitation of oil started in 1859. So far I have traced the claim “oil will run out soon” back to 1862, but that was a quote of an earlier statement. It is inevitable that we will exploit this resource. Whilst the technology and economics may be shaky at the moment, it is changing. At that time CSP could run a single 50MW generator, but without heat storage, and only if they used an auxilliary natural gas (NG) fired turbine to run it up to speed until the CSP element could take over. That CSP could then run the unit but again, only during hours of sunlight, and the yearly average power generation had a Capacity Factor of around 15 to 17%, effectively averaged across the year at around three and a half to maybe four hours a day. With heat storage, because they were diverting the heat for later generation, they could run a 20MW generator, but still only managing a year round average of five hours at best, and again, with the assistance of the NG turbine to run it up until CSP could take over. That modelling in the paper said that within the short term, (2008, now long since past) they would have CSP running a single 250MW generator, effectively on the same basis as for coal fired power. Now, here we are in 2014. The best they have now is the specifically designed (only for CSP and at enormous cost) unit for the Ivanpah plant. All it can run is a 125MW unit, (and there are three of those units at that plant) and it is currently operating at a CF of around 12 to 15%. It has had more problems since opening than you might expect with any new power plant, and in fact they now seek to be able to run the NG element of the plant for longer periods of time to provide the electricity that they have promised to deliver, now somewhat less than a quarter of what was expected. This plant has no heat diversion capability. It still cannot run a 125MW generator solely on solar power. The best plant for CSP with heat diversion is so far 20MW, and even with 16 hours of heat diversion it barely manages 62% CF across the whole year, and in fact, has to close down over the mid Winter Months, because they cannot even get the heat up enough without diversion to make the compound molten enough to make steam to drive the turbine. So, here we have the green dream, supported by peer review modelling, and it did not even get close to what the model predicted, and the result they all so fervently hoped for. They have now been working absolutely flat out on improving the CSP process for more than a decade, and they are not even getting their head above water in fact, just wasting literally Billions of dollars. The dream idea that the technology is just around the corner now has been in vogue now for all that time, and the more they try, the more they find it cannot be done. Spain is held up as the shining light for Solar Power, when in fact all Spain has achieved here is to prove conclusively that CSP is a failure. They have 24 of these CSP plants. The total Nameplate is just under 1800MW, and the average CF for ALL of them is 28.7%, which in fact is lower than for Wind Power. The total power all 24 of these CSP plants deliver in one year is supplied by the Bayswater Power Plant in 93 days of normal operation. There is a bated breath expectation that the technology is coming, and all we have now, after hundreds of billions of dollars being spent is an advance barely beyond square one. Any major breakthroughs they have had have so far all flopped miserably. You can keep dreaming, but in the near seven years I have been writing about all of this, any advance has been minimal, and absolutely nothing even close to what was so confidently predicted. The thing these denier dunderheads don’t realise is that the smart money is on renewables. Because renewables don’t cost anything. Tax payer foots the bill for supply and construction. Tax payer then subsidises projected production at extremely over-inflated use-by date and output projections. The actual out put is about 8% of projection for about 30% of projected lifespan. 90% by on demand coal and gas. Which means that over the life of the Wind Farm all these deniers are actually paying for 100% Wind Power while only receiving 10% then being double billed for a further 90% for the on demand coal/gas to maintain the supply at 100% of the energy required. Therefore consumers are paying bills comprised of 100% charge for Wind Energy which only supplies 10% and a further 90% charge for the on demand coal/gas supply required to make up the shortfall for most basic energy requirements. And the wonderful thing is that all the grants and subsidies go directly overseas to international parent companies who manufacture and supply the turbines, and who only employ minimal contract workers for maintenance. You can fool some of the people all of the time, and all of the people some of the time. But it seems if you get into renewables you can rip off all of the people all of the time. You are such a troll Blackbladder…..
BS… you didn’t actually read what he wrote did you? I don’t think BA did either- attempted comedy, perhaps? or the confused ramblings of someone spruiking renewables on the one hand, but pointing out its flaws and the naked carpet-bagging by renewables “investors” on the other. I didn’t realise covert theft and fraud was such a laughing matter, but there you go- learn something new every day. Don’t you think the opportunity cost of diverting money from real problems and worthy causes like cancer research, etc. to address fictitious problems with non-solutions is somewhat serious and worthy of at least some semblance of due diligence on your part, Gee Aye? I look forward to your usual pseudo-cryptic and evasive response to that question, as I’m sure smarminess will solve all the world’s problems if given half a chance. Careful, this is not the real BA4, but a surprisingly good satirist pretending to be BA4, ans also SF and Chet. I wonder now. Perhaps MV. Naah, surely not. Tony, it is the real Backladder though. Winston I have no idea why you asked me that question but I agree with you. I think we should spend money wisely and rationally as you suggest. But Winston, can you refute that both you and BS (ok you can’t speak for BS) did not read what Backladder actually wrote but instead inserted your negative interpretation that resulted from your assumption that it was Blackadder writing? I’m going with Winston here – confused ramblings. Of course I did… just going along with the spoof. I had to read the post twice before I caught the slip streamed L from 2nd to 5th position. Samoans call that a glottal stop. I will own up that I thought it was the “real BA”, if there is one. I plead though that it was remarkably similar to his previous posts, and as usual seemed to lose the trail of breadcrumbs halfway along. I did actually read the post in its entirety (and couldn’t actually believe what I was reading), but didn’t twig that it was not him. So I am doubly at fault. Mea Culpa- I’ll have to pay more attention next time to dyslexic avatars. don’t you think the avatars are nicely rendered though? There has been a lot of effort on the facial features, sticking the stogie in its mouth and adding the swirling mist (I assume it is mist). Much more effort than stealing someone’s photo of a leaf. Agreed. My apologies, Gee, for going off somewhat half cocked. It is always a good day if you can fit in at least one rant. Could the leaf eat steak please. I don’t eat meat. Wind turbines are lucky to last 5-15 years, of highly erratic output. Solar.. has diminished output quite rapidly. 10-15 years real life.. at 0-7 hours a day. They are not viable for “long term”. Some coal fired, nuclear, and hydro are way over 50 years old, and with upgrades to meet new standards against REAL pollution, many will last a lot longer. ! You assume that Nuclear would continue to be based on uranium-based fission technology. There are other technologies waiting in the wings, including cold fusion and the reprocessing of “spent” fissionable materials. The IEEE put out some articles on the subject, a few years ago. I will see if I can find the references. Rereke, I would love to think that fusion technology is just around the corner. We could all stop this debate and get on with our lives. But that particular panacea has been promised as being only 20 years away, for the last 60 years. And despite some recent advances, even if it were available tomorrow, would still take many years or decades to roll out across the world. To your second point, I presume you are referring to ‘breeder’ reactors which can use up the spent fuel from older cold water reactors, and even make more? Again I would love it if this were to be the answer to our energy problems, but it has proven to be a technological nightmare and at this stage, despite a degree of revival, has been put aside. These types of reactor are cooled with either liquid sodium or liquid lead. Sodium catches fire when in contact with air, meaning that your plant cannot suffer any leaks. However the test plants using sodium could not prevent leaks and subsequent fires. The technology to make a plant totally leak proof does not exist. Similarly, hot liquid lead is highly corrosive and inevitably causes radioactive leaks. These plants may become economically viable when the price of uranium ore goes up as supplies dwindle, but that hasn’t happened yet. Thorium also offers the possibility of using up ‘hot’ residues, and that might be what Rereke intended. I agree with you that liquid metal cooling isn’t the first choice of the safety minded. Equally, that the large scale introduction of new nuclear technology is 20 years away as a minimum, despite the huge interest and resources going into the area. So what is the choice? Neither wind nor solar are reliable enough to maintain an electricity grid. Huge amounts of storage capacity would be needed, and the only current large scale method is pumped hydro. The amount needed most likely exceeding what Australia could exploit. Besides it loses 25% of the energy making renewables even more costly. Wave energy regularly proves disastrous, as it has for the last 100 years. Tidal energy in France is said to be the lowest cost electricity available, but that is after paying off the Rance river dam over 40 years. Its initial cost was such that France has no intention of repeating the experiment; besides the power comes twice a day for a few hours only. So for the next 20-30 years it looks like Australia will have to rely on conventional sources of electricity. We should try and make the best of that. And if there is no imminent catastrophe from CO2, which clearly there isn’t, then we have plenty of time up our sleeves, and plenty of reserves in hand to use the cheap, sensible fossil fuel options until such time that the alternatives are sufficiently developed to provide a proper competitive alternative. I find the horse goes much better before the cart, than vice versa. Hi Graeme, it’s a good question. What is to be done? Whilst I am a firm supporter of renewable energy, I’m also know that we will be using nuclear, coal and oil for a long time yet. The point is that we need to use all solutions and there is really no going back from renewable energy. There is too much momentum behind it and in the long run, it has no fuel costs. Also, peak oil is a reality. If it weren’t, we wouldn’t be looking to horrifically destructive tar sands mining, arctic drilling or fracking (whose wells suffer from very short production spikes) to supply the world’s 89 million barrels of oil a day and growing. If we acknowledged the seriousness of the threat of peak oil humanity, and the pollution from coal of heavy metals, sulfur and nitrogen oxides into the air and sea, the destruction of the landscape, then most would likely agree that all options have to be developed. To take a black and white view either that either renewable’s must be scrapped, or that we must stop using fossil fuels or nuclear soon are both equally deluded thoughts. Suggesting that every business and every government involved in using and developing renewable energy stop now is not within the realms of reality and as good as suggesting we go back to using whale oil. It’s here to stay and growing. The first test nuclear plant required more electricity to run than it delivered. But no one stopped there, even when the original engineers at G&E and Westinghouse new from the drawing board that after taking into account construction, decommissioning and waste storage costs that nuclear is not economically viable as a business. It requires our tax dollars to subsidise it, whilst still on average supplying 11% of the worlds power. The visceral hatred of renewable energy technology by some seems to be more of an idealogical issue, given that it’s beginnings compare well with that of nuclear technology, albeit slower. Solar cannot at the moment with todays tech provide anymore than perhaps 12% of load capacity to a grid. But that will change. Even simple rooftop solar water heaters can reduce a households power bill by up to 40%. The point is that everything will be need to be utilised, that includes renewable energy. Many forms of heat storage for solar thermal are being developed to allow power production when there is no sun. Show us. Do some research. This is despite its ability to store energy in the form of heat. That heat storage is only measured in hours, and will never be longer than that. That returned heat from storage still only permits the compound to stay molten for short periods of time. Even that vaunted Gemasolar plant (20MW) in Spain which has 16 hours of heat diversion can only barely manage to make it through the night until the following morning when the Sun again assists with the process. Everything works backwards from the weight of the rotor inside the generator. That weight has to be turned over at 3000RPM, and that’s 50 rotations each second, snap your fingers, 50 rotations. (or 3600RPM in the U.S.) That weight has to have a trubine capable of doing that. That turbine is then turned by high temperature high pressure steam. The compound then has to be molten enough to make that steam. The reflected heat has to be enough to do that. Put some of that heat aside, and then call it back later, and there’s a trade off. You cannot connect a 50MW generator up to a plant which has enough heat diversion to get it through the whole non sunlight period, even at the height of Summer. The weight of the rotor capable of inducing enough EMF into the stator is too much and it would not enough turn over, let alone run all day and night. Hence, the best they can manage so far with 16 hours heat diversion is 20MW. That Ivanpah plant (with no heat diversion) has a 125MW generator, and a specially designed turbine to drive that, and still they cannot manage to drive that for better than a few hours a day, even in Mid Summer, a classic case of over reach, thinking that they can actually drive that 125MW generator, even with the latest state of the art technology specially used for this plant. I understand the concept is not all that easy to grasp, and here is a diagram (at this link) that hopefully might explain it a little better. Keep in mind that this diagram is basically theoretical in nature, because, while here it shows almost 8 hours of heat diversion and a fairly constant 50MW generated electricity, this has not yet been achieved, even at the height of Summer, let alone all year round. 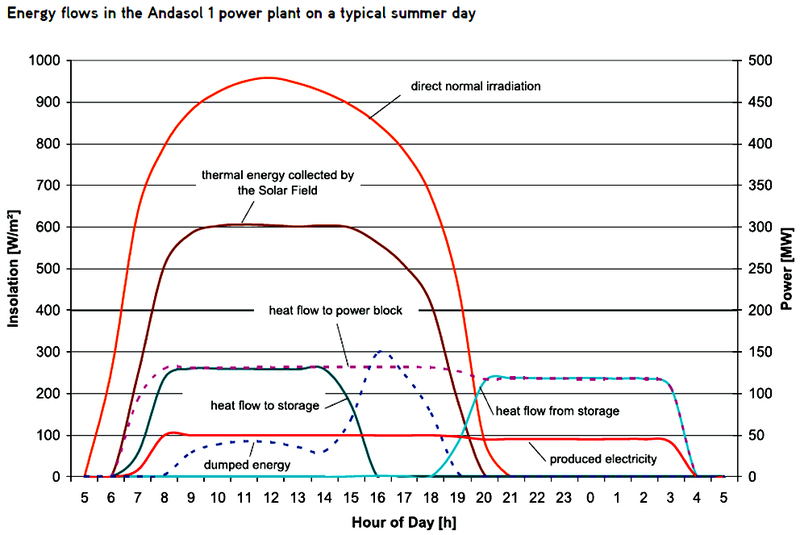 This Andasol 1 plant has a CF of only 40%, barely nine and a half hours a day, and has never achieved 24 hours of power generation, and 15 hours is about the best they have achieved, and that for barely a couple of days in Mid Summer. This plant has heat diversion of 7.5 hours, and that, now, is the absolute maximum they can utilise for a 50MW Generator. Waiting for your thoughts Tony. To think these people are let loose on the streets. 1. coal +water slurry will burn. It was developed in the 1970′s as a way to by-pass coal trains. Basically it turns into water gas and burns in the boiler. Uses heat up, so co-firing with oil (or gas) recommended. 2. Conversion to ‘syngas’ heat mixture and convert to carbon monoxide and hydrogen. Yes, diesel will run on it. Known since before WW1. Slight problem with octane rating and not likely to be that wonderful in modern high efficiency diesels. Also note that diesels aren’t as efficient as current boilers let alone newer ones. 3. Heat engine? Are they referring to the Stirling engine? Yes, at around 700℃ it will be around 50% efficient as against current boilers ~38-39% and newer types 43-44% efficient. But you are going to get MORE nitrogen oxides out at the higher operating temperature. Octane rating is for internal combustion motors, in case they change their minds. Cetane rating for diesel not known and can’t be bothered wasting more time on this. Hey, come on Tony ! ….. just to get it started by the afternoon. This is supposedly the largest Concentrating Solar Power plant on Earth. It has three units, each running a 125MW generator, so 375MW in all, covering almost 15 square kilometres. It has been in full operation now for 8 Months, and is currently running at a Capacity Factor of 11%. That’s around two hours and forty minutes a day. The total power this plant has delivered in those eight Months was delivered by Bayswater in 4 days with all 4 units in operation. This is the future that greens and renewable power urgers have for us. Oh, I’m just so thrilled!!!!! I’m sure that once they get a decent gas budget, they will be able to push that factor up…. ….. maybe even to the amount they would have got from the gas by itself ! Enough gas, they may even get some output over night. Thanks for your response. This is an enjoyable debate. It’s worth remembering that the first nuclear power plant required more electricity to run than it delivered. Then it went on to power one lightbulb. The same development curve can be applied to renewable energy. Here’s the thing though. Renewable energy is not going away. People want it, thousands of companies and scientists are developing it and improving it. At the same time, coal, oil and gas are here to stay for a long time yet. We will continue to use all forms. No matter how many papers you or I reference for or against renewable energy, it is not going to stop. We are running out of cheap easy-to-get oil, which is the basis for almost every aspect of our comfortable healthy lives. Coal, oil and gas extraction have large environmental problems. That said, renewable energy paradoxically also has environmental issues. No matter how much you may want renewable energy to disappear, it isn’t going to. No matter how much I many want to see fossil fuels use stop, it won’t. But what we can say for certain, whilst oil output becomes harder and more expensive, renewable energy becomes better and more efficient as technology advances. And in the mean time I’ll keep praying for nuclear fusion. for the life of me I just cannot understand why people are so enamoured by these two renewables of choice, wind power and solar power. They patently do not work a fraction as well as the power plants they hope to replace, and they have barely improved over the last almost seven years I have been doing this. The only thing which has improved, and in fact improved out of sight, is coal fired power technology, where they can now drive almost double the size generators they once could while burning less coal, and emitting less CO2. If ANY other new technology worked as poorly as these two renewables, it would be laughed out of existence, literally. The only reason that they are being accepted is because the general public is so utterly clueless. To them, power coming out of the hole in the wall is just that, electrical power. Because it is ALWAYS there, then the impression is that renewables are in fact supplying that. The only reason it is always coming out of the wall is because of coal fired power. Take that away, and then people will see exactly what renewable power is, a complete and utter failure to do what it claims it can do. While the complacency of ….. it’s always there ….. pervades, then renewables will get away with it, because the public have no idea. Think that in the Whole World, 60% of every KWH being generated is required, ABSOLUTELY for 24 hours of every day, EVERY DAY. You NEED power plants which can actually supply that level of power. Renewables, Wind and Solar, supply in totality 2.11% only of all that power. They will NEVER reach 20%, NEVER, and I cannot stress that enough. Even that measly 2.11% is still only on the basis of an average of barely 6 to 7 hours a day, so it doesn’t matter if they make 20%. You still only get power for one third of the time. If they are going to rely on these two renewables, then let’s face it. The World will just shut down. There is no debate when it comes to renewables like wind and solar. They just don’t work. The public has been hoodwinked on a grand scale. Even though I disagree with much of what you attest above, Terry, you are a better class of alarmist, and polite to boot. Well done, sir. Unfortunately for you (and all of us), I think renewable wind and solar will ultimately fail spectacularly, because I think other technologies will come to the fore before any technological breakthrough can make wind and/or solar a viable option, if that is even possible. Obviously, I fall into the group who believe that there are irredeemable problems with both that cannot be surmounted – hence my disgust at the wasted billions of dollars trying to make pigs fly. Thanks Winston, I appreciate your politeness too. I certainly acknowledge that our current quality of life is entirely due to oil and coal. Without it we would still be living a pastoral existence and perhaps still dying at around 40 years of age. Though I’m no alarmist. Whilst I believe in the science of climate change, I still believe that it’s degree is open to more scientific research and even refuting, as is all science. There is around 3000 Gigatons of naturally occurring Co2 in the atmosphere and we have added another 500 Gigatons, or around 17% to it since the start of the industrial revolution. And we are adding an additional 35 Gigatons to it each year. Given that one of the laws of physics states that ‘for every action there is an equal and opposite reaction’, it would be wilfully stupid to say that there can be no effect anywhere, in any way whatsoever. Not only that, but there isn’t a single ecosystem that is getting better under our stewardship. Our massively extractive processes and unabated consumerism has reached a critical mass. Where once we could get away with it, the shear scale of what we require now and its effects on the earth is so much more impactful. For me, renewable energy marks a shift in our attitude to the planet, away from the biblical doctrine of dominating the earth to working with it. Whilst peak load capacity still needs to be supplied by coal and nuclear, it is not possible to hide from the fact that Germany’s feed in tariffs made it possible to for them to produce a world record breaking 22 gigawatts of electricity per hour in 2012. I understand that billions are going to subsidise renewables, but just as they are for fossil fuels. But I of it as research money and a drop in the ocean compared to military expenditure. I’m under no illusions as to it’s shortcomings, but that will improve and we simply are not going to stop developing it. My God! What will Al Gore say about this? We can’t allow the Great Gore’s rules for correct behavior to be ignored this way. We need to do something — and fast! So I’ll call up the Climate Change Police and get them into action before it’s too late. Now if I could just remember where I put that phone number… …oops, did I put it in the shredder by mistake? I must have. And now we’re doomed, fried, dead and buried. And it’s all going to be my fault. How can I ever sleep with myself again? Perhaps Australia can help put Germany back on track to both meet its abandoned target and to lead the world again. All we have to do is send Ross Garnaut over to help them implement a healthy Carbon Tax, and they’ll hit their 40% cut target, no problem. Earth has hundreds of bitumen seepages. Many have been considered a commodity and used for a variety of purposes including, by the Mesopotamians, for waterproofing boats. So I’ve read. Some of these seepages are call tar sands. These do sometimes seem a bit messy as regards the local environment and can exist for thousands of years. The La Brea Tar Pits are an example and have trapped and killed many animals. The Canadians should be admired for taking the initiative to clean up such a large environmental mess without seeking funding from the UN or other green organizations that might better use their resources to stop the killing of eagles and bats from that other ancient power source with spinning blades. The problem John is that an area the size of England containing boreal forest has been removed. That landscape is now barren and pocked with vast tailings ponds filled with billions of gallons of toxic sludge. Oil companies admit that the landscape will never recover in anyone’s life time. This is all to produce 170 billion barrels of oil. That sounds like a lot but it is only enough to supply the world with oil for just 5.5 years. Or the US for 23 years. Not only that, but it is immensely more energy intensive to produce a barrel of oil from, delivering an EROEI of between 3 and 6 to 1. Contrast that with Middle Eastern oil which has and energy returned on energy invested ration of between 10 -20 to 1. But every oil exec openly admits that the days of conventional oil are coming to an end. If anyone thinks that tar sands is a panacea for our encroaching oil crisis or that it will reduce the costs of it, they are misinformed or totally deluded. Yes, people deliberately destroying natural sites for profit aren’t my favourites either. and this is worth a read. Similar clear felling of tropical forests is also happening in Malaysia, Indonesia and New Ireland. Oil slicks are common on the beach at Santa Barbara (Ca). It’s seepage from a trough near Santa Catalina. Natural reserve though, so can’t be exploited. ***but obama just said no region had more at stake than the Asia-Pacific! Nearly 300 million Indians do not have access to electricity, and millions more get it only sporadically. The benefits of solar and the environmental costs of coal are so profound that India has no other choice but to rely more on renewables, said Dr. (Rajendra) Pachauri (IPCC Chairman). CAGW zealots – who claim they care about the poor – are against coal power to lift hundreds of millions of Indians out of poverty, but in favour of subsides to the likes of GE and Siemens! They’ll get their first chance in the coming weeks as lawmakers negotiate the fate of dozens of expired tax provisions and try to reach a deal before this Congress adjourns in mid-December. Now and perhaps again in January, the wind credit will be a test case for how targeted tax breaks — particularly those championed by Obama — will fare when Republicans run both chambers of Congress. Earlier this month, the Intergovernmental Panel on Climate Change (IPCC) released a major new report, summarising scientific knowledge on climate change. It contained something of a milestone in IPCC history – a chart linking greenhouse gas concentrations to fossil fuel emissions, rising global temperatures and sea level. Joint accountability and collective action are important messages from the new chart, and ones that may just help to shine the spotlight on other big emitters to fall in step as we head towards Paris in 2015. TerryYaki was talking about the oil sands of 50 years ago. Some of her factoids have to be updated. Not all oil sands are covered by boreal forest, much of the surface supports only grasses. Large areas that have been mined (sand cleaned and replaced) have been reclaimed in our lifetime. Tailings ponds are being phased out. Marginal cost to produce a barrel of synthetic crude from oil sands is ~$13. This points to a return on energy that blows the doors off a wind farm. In Ontario, taxpayers pay $.135 per kwh for a windmill compared to $.06 for NG. Again, this says something about return on energy. Wind energy is now a mature industry, there should not be even one more windmill paid for by taxpayers except for research. By the way, the watermelon industry does not spend much effort explaining to engineers like me how C02 affects cloud formation. How does a relatively inert trace gas cause more cloud cover at night and/or less cloud cover during the day. Intuitively, it sounds pretty ridiculous to me. Why would you wish this on any country just to deliver 5.5 years of US oil consumption. I guess as long as it’s not in your backyard eh? Is it a strict 2020 or 2030 goal?